Ten of Liverpool’s best new bands will play The GIT Award alongside nominees on May 13 for an all day event, Getintothis’ Craig MacDonald has the scoop. 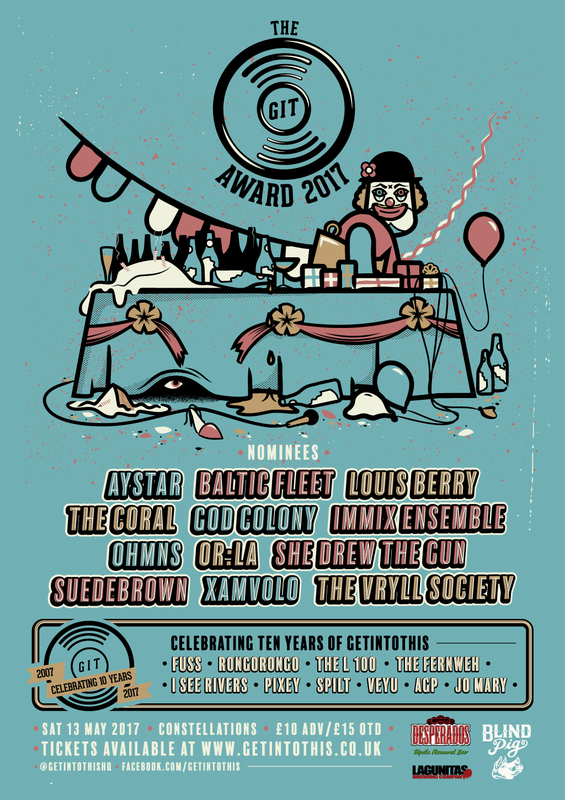 Getintothis can today reveal details of a special happening to celebrate our tenth birthday, with ten of the finest new Liverpool bands set to play The GIT Award ceremony at Constellations on May 13. From our beginnings in 2007, Getintothis has championed the finest new acts from Merseyside and beyond. That dedication to unearthing fresh talent is still very much at the heart of our values nearly a decade later, with our monthly Deep Cuts live events the latest example of our dedication to the cause. Next month at The GIT Award‘s sixth edition, that commitment is celebrated with a special element taking place during the day, as we bring together some of the finest new acts from the region to celebrate our 10th birthday. Having melted our minds with their space age drone pop for just over a year, FUSS will be preparing for their appearances at this year’s Sound City and Psych Fest gatherings with an appearance at our party, while The L100 will be demonstrating why they are at the very forefront of Liverpool’s blossoming urban game as they bring their slick grooves and cutting bars to the proceedings having supported the likes of KRS One of late. Fresh from turning heads at Threshold Festival and ready to hit Wrong Festival with their luring post-punk snarls, RongoRongo will be showing why they were nominated for last years GIT Award honours, with the six piece joining the rising psychedelic talents of The Fernweh, as they build on the momentum racing through them following their much loved debut long player, with Cerys Matthews and BBC 6Music being counted as fans. Enchanting many at the Florrie at Greg Wilson’s chaos soaked 14 Hour Super Weird Happening recently and ready to cast his spell on FestEVOL Gardens, AGP has blossomed into one of Liverpool’s most intriguing prospects of late, with his hazy lo-if workings bringing tides of sensory bliss. Similarly, following an incredible performance at our second Deep Cuts event, Nordic songstresses I See Rivers will be casting their spell on the Baltic crowd once more and showing why they were recently nominated for this year’s Glastonbury Emerging Talent Competition. Erupting under a wave of sunshine soaked indie pop, Pixey will bring her candescent cuts to the party having recently wowed plenty with a stirring set at Live at Leeds. Veyu have long been a group that Getintothis holds dear to our hearts, with the one time GIT Award nominees recently releasing an early contender for album of the year with Underbelly and further cementing them as one of the most integral acts in Merseyside music since we began. Rounding up our line up are two of the most promising acts currently sending sonic tidal waves across the Mersey and who we are lucky enough to have hosted at our previous Deep Cuts events. Having came, saw and decimated the Buyers Club and pretty much every venue they have played, the frenzied grunge punk powerhouse that is SPILT will be primed to take Constellations firmly by the scruff of the neck, while the reverb soaked garage rock of Jo Mary shall be sure to get many a folk marching to their beat. Filled with attitude and bite, they are a delightfully danger fused prospect to witness in the flesh. Combining this set of acts together with this years nominees, you can see that this year’s GIT Award is lining up to be quite the event. With a lineup that shows not only the wealth of talent, but the diversity of artists that Getintothis continues to support now ten years since it started, what better way to celebrate. 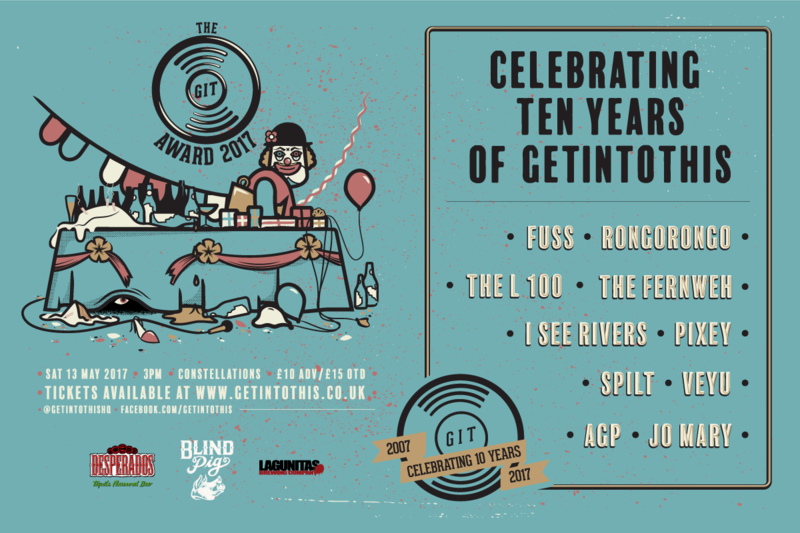 Ten years of Getintothis takes place at The GIT Award 2017 in Constellations from 3pm till late on May 13, with tickets on sale here.